We are devastated to report the passing of Saku, beloved buddy of Auntie Dawn and Uncle Wayne, and big brother of Willoughby. Sending love to them. We know words can’t express anything right now. 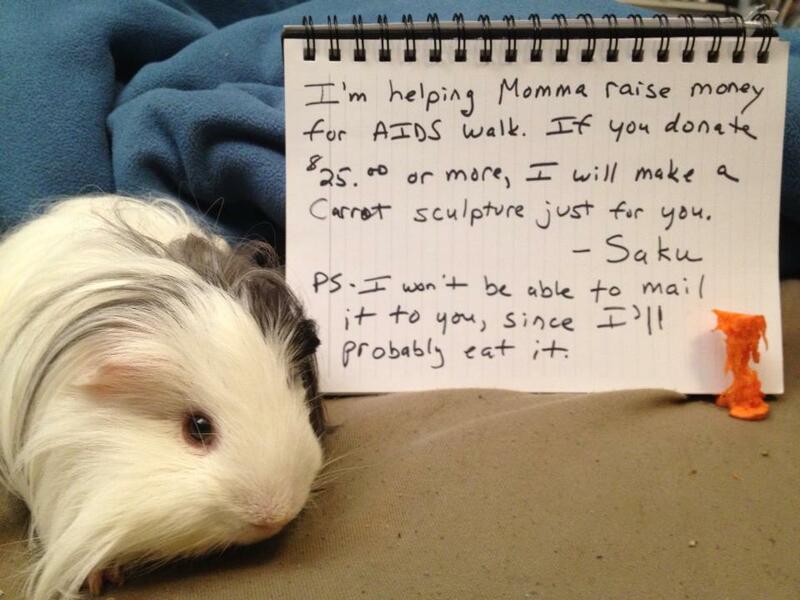 Saku’s last unselfish act was to promote his Momma’s fundraising for the AIDS walk on May 19th in New York. He developed a digestive problem the next morning and passed away with his momma and papa yesterday evening. Mariusz will be waiting to party with him on the other side of the Rainbow Bridge, and we reckon Hugo, Fred and George will be right there too. And of course he lives on in Jemima’s books. He starred in a new story just last week. Live long and prosper, dearest Saku. What a very sad day ES. I just read your comment on Dawn’s thread, and I can’t stop snuffling. How do we get so attached to these beautiful little creatures? They get into our hearts, even though we have never had the privilege of meeting them. Run free over the rainbow bridge little pig. You may be gone but you will never be forgotten. Thank you both. It’s hard to put anything into words right now. So sorry for your loss (all of you). How sad. What a lovely picture above of Saku – it made me smile, then your post made me cry. Hugs to you all. Thank you, boys, Mummy, and everyone who posted. I loved Saku immeasurably, and I’m not sure how I’m going to make it through the next few days. But I need to be strong for Willoughby. I am comforted by your friendship and by the love you all have for Saku. He was an extremely lucky big, to have a huge extended family.